Oskaloosa, Iowa (September 30, 1970) - John Moss of Riverside, Iowa, captured the 50-lap Southern Iowa Racing Association season championship on Wednesday night at the Mahaska County Fairgrounds in Oskaloosa, Iowa. 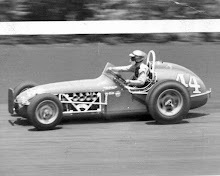 Moss took the lead from his pole position at the drop of the green and was never threatened as he led all 50 circuits. 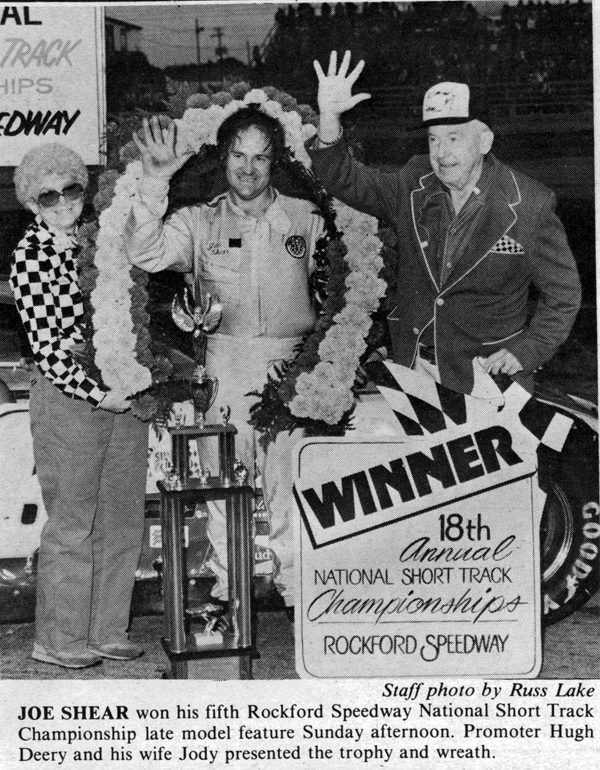 Moss pocketed $550 cash and also received the track championship trophy. His win clinched the SIRA point championship for the 1970 season. 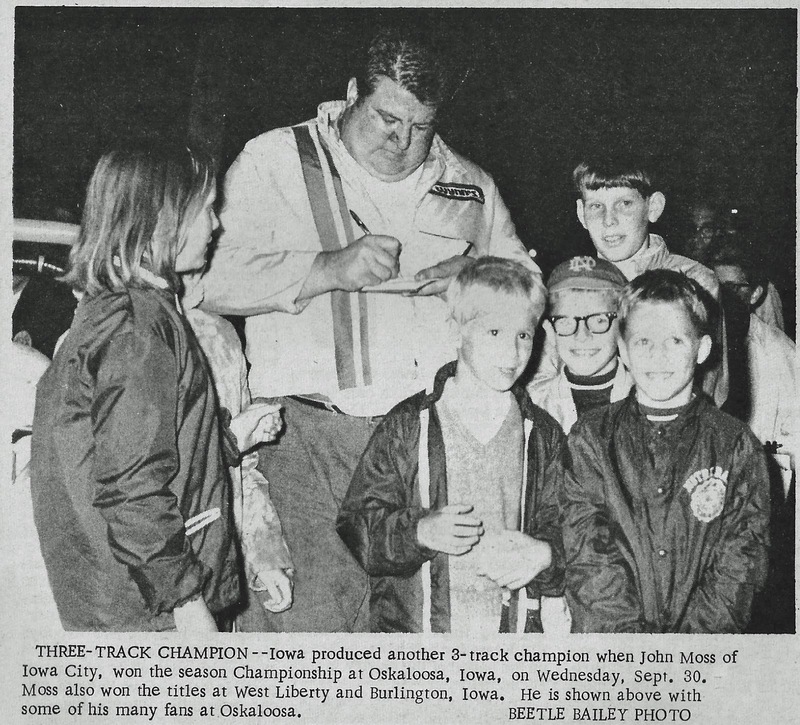 With point titles already won at Burlington and West Liberty, Moss became a three-time track champion. Stan Stover of Reinbeck would finish second in the feature followed by Dan Dickey of Packwood, Ron Perdock of Washington and Jerry Roberts of Prairie City. Ed Pilcher of Ottumwa would start the evening off by winning the 5-lap trophy dash. 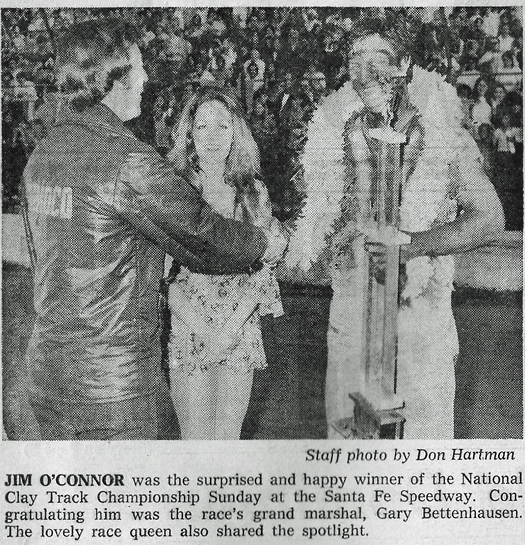 Mark Mosier of Washington, Ed Sanger of Waterloo, Mel Morris of West Liberty were heat winners while Morris won the 6-lap Australian Pursuit. Ron Perdock was the 10-lap semi-main winner. 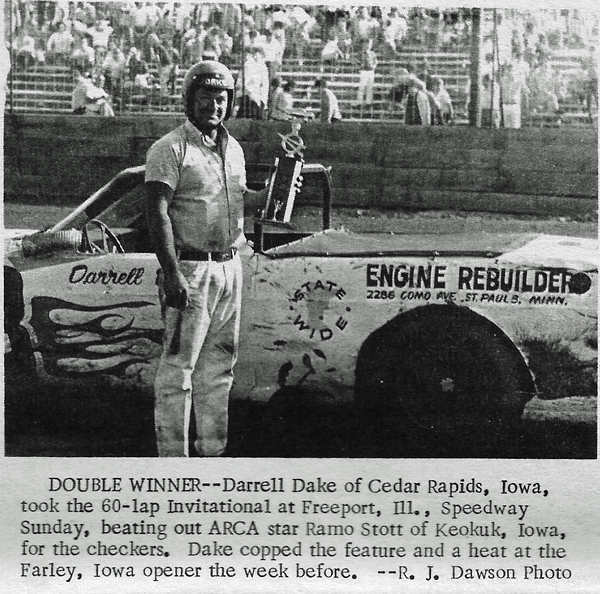 Freeport, Ill. (September 28, 1969) – Darrell Dake of Cedar Rapids, Iowa, won the 2nd annual Midwest Invitational on Sunday evening. 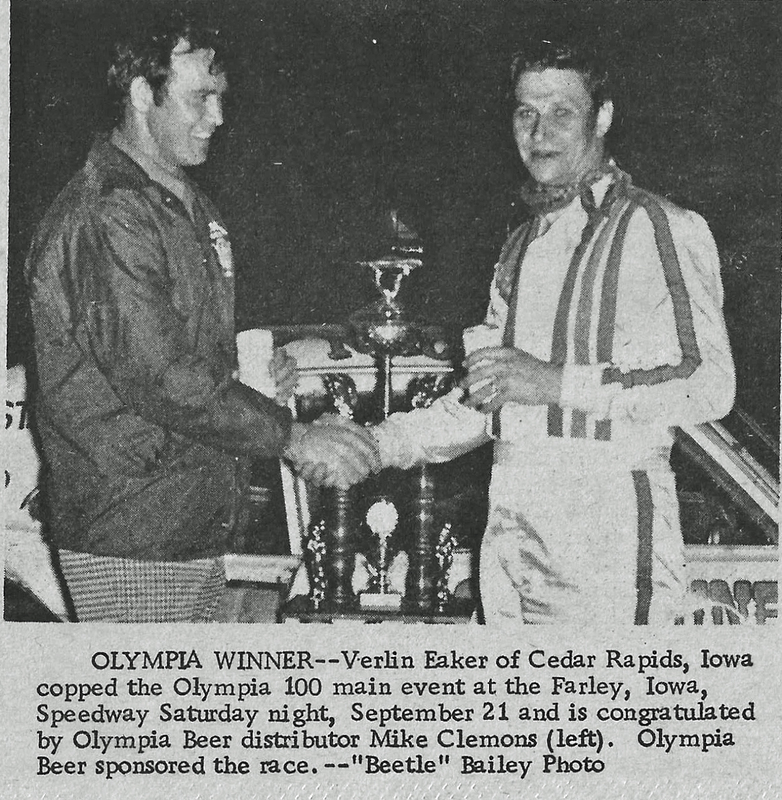 Dake took the lead from Ramo Stott of Keokuk, Iowa, in the closing laps of the 60-lapper and took home the $800 first prize plus lap money. 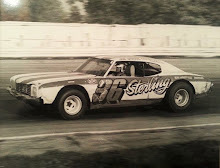 Earlier in the afternoon, Stott won the 200-lap feature at the National Short Track Championship at the quarter-mile, paved Rockford Speedway. 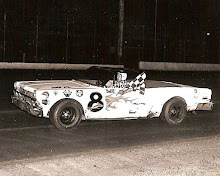 Roger Dolan of Lisbon, Iowa, started on the pole and was off and running in his Plymouth Roadrunner. 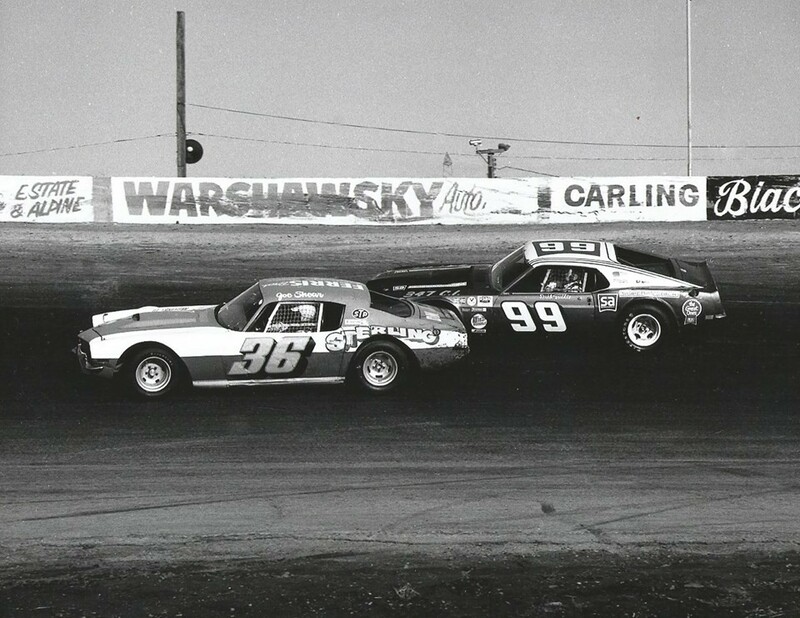 Dolan was never challenged until he broke an axle midway through the race. 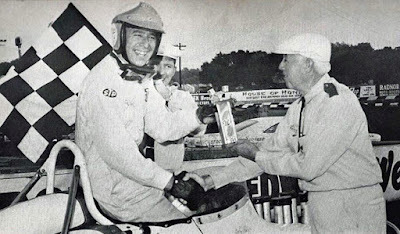 Stott inherited the top spot and was pressed the whole way by Dake and Freeport Raceway champion Lem Blankenship of Keokuk, Iowa. Dake banged on Stott’s bumper as the laps ticked off and when Stott got loose, spinning through the infield, Dake sped by for the lead and the victory. Dake also won the trophy dash as he started on the pole and led all six laps. Dake was chased in the trophy dash by Dolan and Stott. 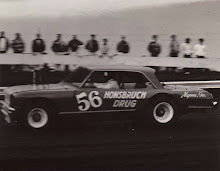 Bill Forbes of Rock Falls, Ill., piloted his Pontiac GTO to victory in the semi-feature. Forbes and Red Droste of Waterloo, Iowa, battled wheel-to-wheel for the entire race. 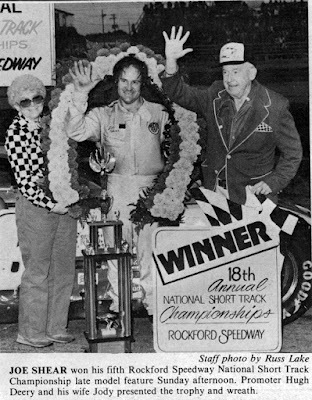 Semi-main – Red Forbes, Rock Falls, Ill.
2. Arnie Christen, Mineral Point, Wis.
3. Fred Strube, Peoria, Ill.
7. 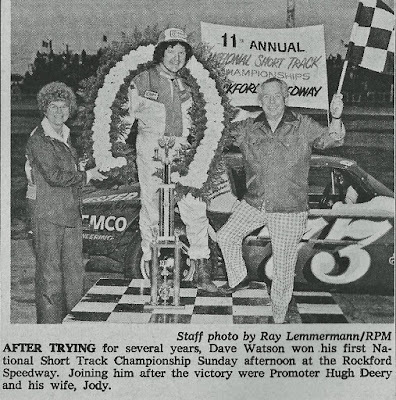 Herb Shannon, Peoria, Ill.
9. 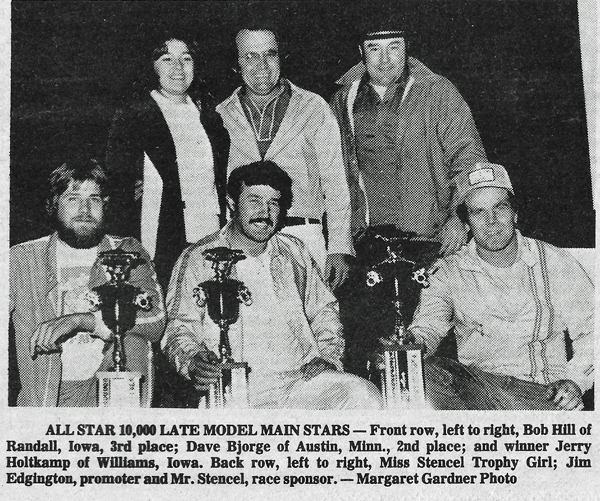 Norm Meinert, Freeport, Ill.
Fairmont, Minn. (September 23, 1978) – The All-Star 10,000 turned into the All-Star 12,000 this past weekend at Fairmont Speedway, as Jim Edgington, track promoter, added extra money to the purse due to the exceptional turn out of both cars and race fans. More than 100 cars took part in the two-day event, including over 60 late models. Fans turned out in near record number, and saw some of the very best racing in the upper Midwest. The best was saved for last as Jerry Holtkamp of Williams, Iowa, Dave Bjorge of Austin, Minn., and Bob Hill of Story City, Iowa, staged a three-car race for the checkered flag in the 40-lap late model main event. 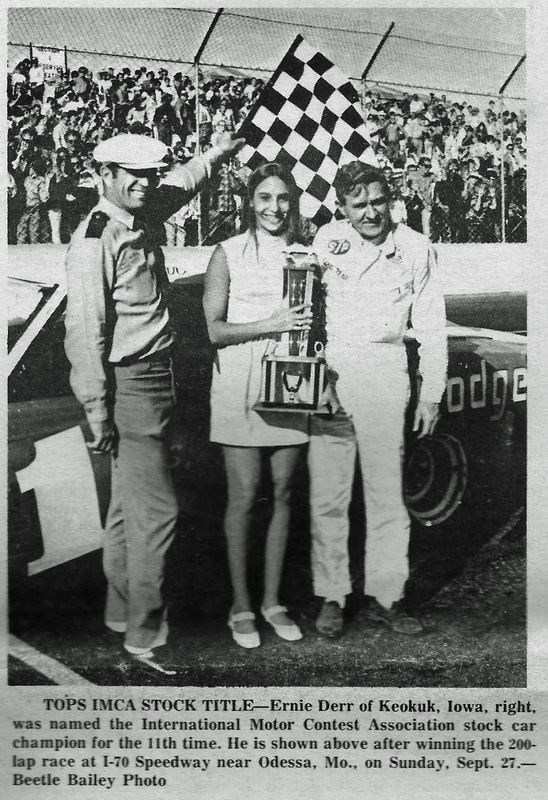 Hill started on the pole position and took the lead at the opening green flag and held it for the first 25 circuits. 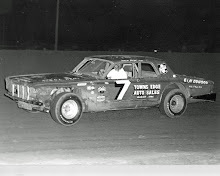 Holtkamp, who owns a couple of feature wins this season at the half-mile track, took the lead away from Hill on lap 26 and then held off a severe challenge from both Hill and Bjorge to take the win. 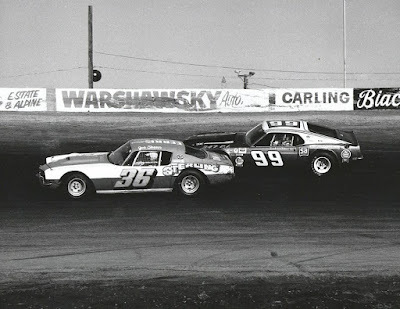 The three drivers were never more than a car length apart for the entire 40 laps. 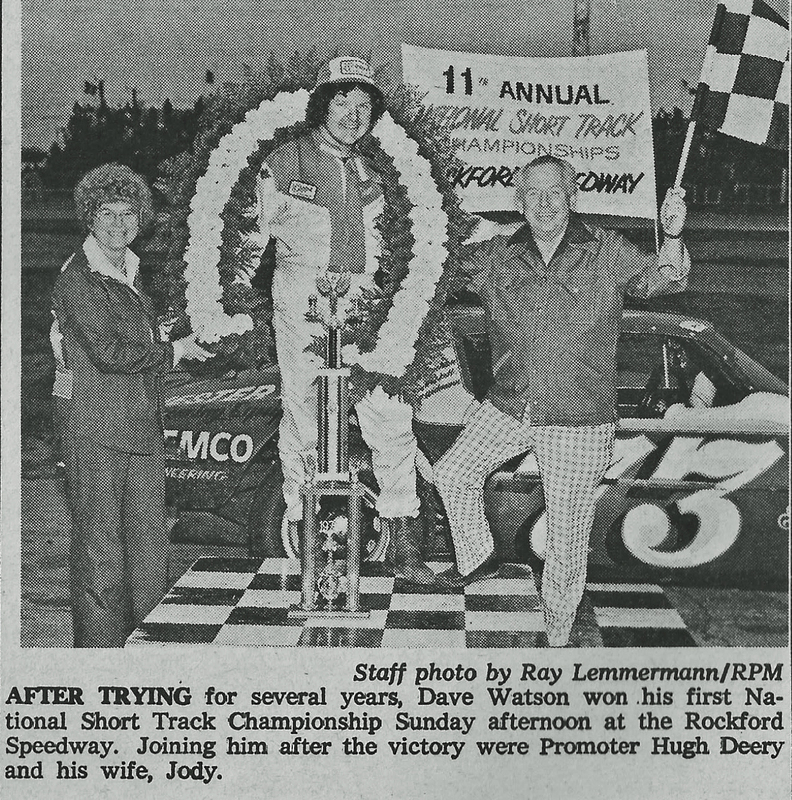 The only caution flag in the feature occurred on lap 6 when Bob Shryock of Estherville, Iowa, the season point champion at Fairmont, tried to get by Holtkamp by going to the high side of the track. Unfortunately for Shryock, he got too high on the track and tumbled off between turns one and two. Shryock restarted at the rear of the field and showed why he’s one of the top late model pilots in the Midwest, passing 24 cars and finishing the evening with a top-five finish. Shryock was easily the fastest car on the track. Lee Devries from Hollandale, Minn., won the 20-lap street stock feature. The All-Star drew drivers from six states, drawing competitors from Iowa, Minnesota, North and South Dakota, Nebraska and Wisconsin. 2. Dave Bjorge, Austin, Minn.
9. Jack Harder, St. Paul, Minn.
10. Terry Hanson, Owatonna, Minn.